Prayers can move mountains .......... and the woman has right to be happy ..... it is Corinna Schumacher wife of Michael Schumacher, hailed a heroine after she was pictured smiling and joking during her first public appearance since her husband's catastrophic ski accident. Corinna has spent months by the bedside of her husband Michael, 45, as he was kept in a medically induced coma after suffering a major head injury when he fell while skiing in France in December. 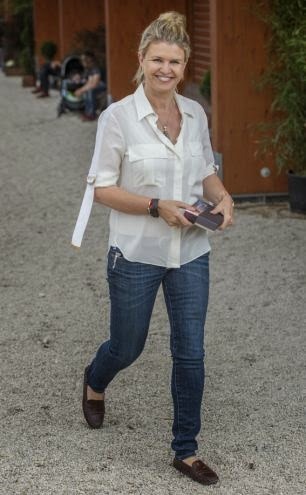 This picture was wide on the web couple of months ago - She was pictured laughing and handing out chocolates at a riding event in her native Switzerland this weekend after Michael was recently transferred from the hospital in Grenoble, France to a unit near his Swiss home. Now there is more to smile as Michael Schumacher has made it home - 254 days since smashing his head on to rocks in a freak ski accident in the Swiss Alps. He returned to his family home at Gland according to Germany's biggest newspaper Bild, way ahead of a schedule set by doctors at a rehabilitation clinic in Lausanne who predicted he might be home by Christmas. 'He is back home again!' the newspaper trumpeted on its website. Schumacher suffered a severe head injury while skiing in the French resort of Meribel in December 2013. He underwent brain surgery at a Grenoble clinic in France and was then put in a medically induced coma. In April, his health condition improved. Schumacher’s manager Sabine Kehm said at the time that the athlete began to stay conscious for longer periods of time, he could hear voices and react to touch. Daily Mail reports that Michael Schumacher has made it home - 254 days since smashing his head on to rocks in a freak ski accident in the Swiss Alp and that the former Formula 1 ace is massaged for hours each day to stimulate muscle mass shed during his long sleep. Although his wife Corinna, 45, and children Mick, 15, and Gina-Maria, 17, are ecstatic, it is understood he remains mute and unable to move apart from random flutterings of his eyelids. 'He relies on the help of strangers 24 hours around the clock. No one dares make a prediction about How long it might take until he has regained motor skills such as language and memory,' said Bunte magazine last week, a publication which is noted for having close contacts with the Schumacher family. Two months ago it reported how work has been going on at his £35million mansion at Gland, a short drive from the rehabilitation clinic, to build a care facility for him in the grounds that is wheelchair accessible. The magazine and a Swiss newspaper also reported that another building has been constructed for his father Rolf to move into from his home in Germany. The prognosis is that Schumacher, whose life was catastrophically changed by a low-speed ski accident on December 29 last year, will need years of therapy and, most likely, will always remain a shell of his former self. The wherewithal to finance the move was never in question. A decade ago the financial bible Forbes Magazine in America listed him as the 2nd highest-paid athlete in the world while the following year Eurobusiness magazine identified him as the world's first dollar billionaire athlete. The fortune remains intact and has grown with lucrative advertising and sponsorship deals which sometimes earned him over £100million a year on top of his race winnings in the last few seasons of his career. Schumacher, 45, remains riddled with tubing, hooked up to complex machines that feed him, enable him to breathe for long periods of sleep, remove waste from his body and monitor vital signs. Many a times, - Medicine, Science or logic may not have a direct and correct answer – but it is faith and optimism ....... Corrina has steadfastly stood by Schumacher and is quoted to be happy at the progress he has made so far and optimistic that much more can be achieved. She is counting the successes one by one and ignoring the likelihood that he will make anything other than a full recovery ~ and millions of fans of Schumi would be elated to read anything about the recovery that he is making .... Champions are made of different stuff.. ! !